Luis Garcia poses with a Mariners fan after touching down in Australia. Photo: AAP Image. 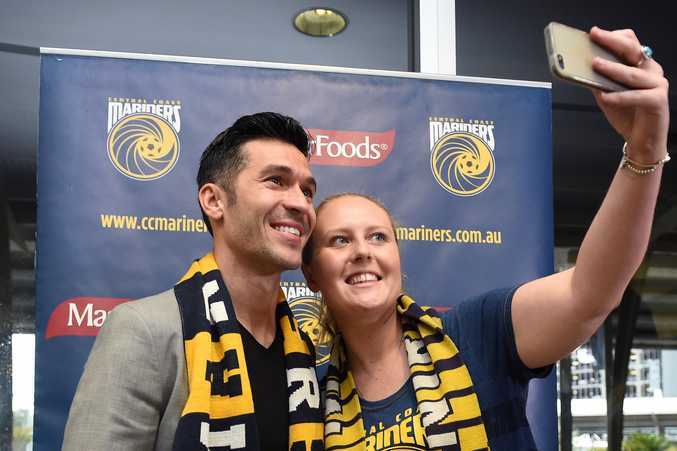 WHILE he might not have had the same fanfare on his arrival as Alessandro Del Piero and David Villa, Luis Garcia has certainly raised a few eyebrows after signing for the Central Coast Mariners. The Spanish winger was greeted at Sydney Airport this week by a small band of Mariners supporters who seemed to be delighted their club had signed a Champions League and FA Cup winner. But while that will always look good on a players' CV, a closer examination by those same fans would see both of those successes were more than 10 years ago when Garcia was playing for Liverpool at the peak of his powers. He might have also won 20 caps for Spain, but the last of those was in 2008. The 37-year-old's most recent claims to fame have been winning the Indian Super League with Atletico Kolkata in 2014, and a recent appearance in the Liverpool Legends clash against a bunch of former Socceroos, including Robbie Slater and Ned Zelic. Garcia looks fit enough, but the fact he has not played competitive football for more than a year rings alarm bells with me, and it should with Mariners supporters too. He certainly talks a good game judging by his comments at Sydney Airport, saying he would be ready to play against Western Sydney Wanderers tomorrow evening if asked by coach Tony Walmsley. But he also suggested that he might not be able to help the Mariners rise from the bottom. "I don't think I can lift them up," he said. While I admire his intentions, I cannot see what help, other than to mentor the club's younger players, Garcia will be to Central Coast. There is no doubt his arrival will get Liverpool fans watching the A-League - if they don't already - but I just wonder what good his signing will do for the Mariners. I'll reserve judgement over the next few matches, but I really can't see Garcia making too much of an impact. Perth Glory got its hands burnt when it signed William Gallas. I just hope that Central Coast does not just get someone who is just looking for a bit of cash to bump up his super. I would love to be proved wrong and hope that Garcia does do well on the Central Coast. Maybe his value to the club will be off the field because it seems Liverpool fans love him and they could boost Mariners' crowds. We shall be watching that space with interest.